Mentor of the Meek was the Star City Games exclusive spoiler they announced yesterday and are currently having pre-orders for 3 dollars a pop, as I stated in my previous article. In my opinion, Mentor of the Meek is a great card; now, from the wording of the effect, I assume you can trigger his ability multiple times, but if I’m wrong, mention it in the comments. 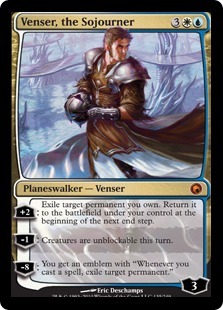 As it’s enters the battlefield, that includes creatures coming into play with Birthing Pod or flashing in from Venser, the Sojourner, letting you blink a Blade Splicer out, then blink it back in and draw a card for 1 more mana. I’m not sure if he’ll be worth 3 bucks a piece after the set is released, but we’ll know when the format starts shaping up. 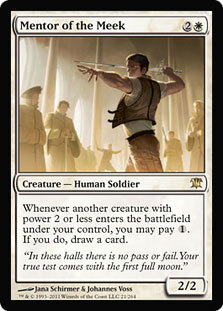 Until then, he’s a fun little card that I plan on getting a play-set of myself. You can only trigger his ability once per creature. When the ability is triggered it asks only if 1 was paid. No matter how many times you pay it, it will only check once to see if the cost has been met and give you only a single card. Thank you! I assumed that was the ruling on it, but I wasn’t 100% sure.